Sept. 11 (UPI) — Blister beetles are chemical con artists, and according to new research, they can adapt their trickery to dupe a variety of bee species. During one of several larval stages, Meloe franciscanus beetles infiltrate bee nests by mimicking the chemicals emitted by female bees — perfume-like compounds called pheromones. The perfume attracts males, which the larvae attach themselves to, hitching a ride back to the nest. Once in the nest, the beetle larvae can subsist on pollen, nectar and bee eggs, emerging as adult bees the following winter. New analysis of the parasite’s chicanery showed blister beetle larvae adapt their chemical ploy to match the perfume of the local bees species. 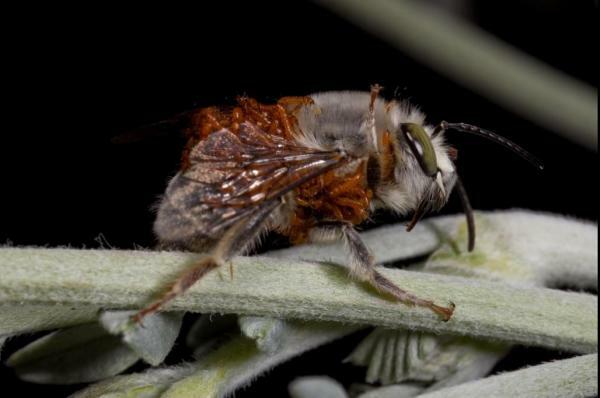 When scientists exposed two different bees species — Habropoda pallida from California’s Mojave Desert and H. miserabilis from Oregon’s coastal dunes — to local blister beetles, they found the beetles were more attracted to larvae sourced from their home turf. Chemical signaling is a vital communication tool for many insects. And as insects evolve and diversify, chemical coding helps species differentiate themselves. The latest research — published this week in the journal Proceedings of the National Academy of Sciences — suggests parasites evolve their chemical repertoire alongside their preferred hosts.